The year is 1866 and the Pacific Ocean is being terrorized by a deadly sea monster. The U.S. government dispatches marine life expert Professor Aronnax on an extended voyage to investigate this new threat. 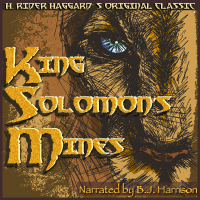 He discovers not a monster, but a marvelous submarine vessel piloted by a deadly captain with a secret agenda. 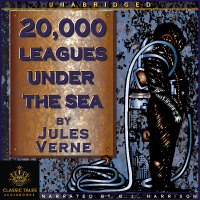 Heralded as the father of modern science fiction, Jules Verne demonstrates his powers of predictive intuition in this classic underwater adventure. More Sea spp than you can Throw a . Stick at! From Anabel Ford of Santa Barbara, California on 12/4/2018 . Amazing account of under water knowledge, imaginative presentation of discoveries, and remarkable sci fi that presages the actuality. Some nay think the discussion of the animal and plant life in the sea is over the top, but this is a remarkable account of the state of knowledge of the sea; and much of it holds up a century later. I am wondering the date of the translation as the colloquial words are current. Of course , up to the reading standards, Classic Tales excels. From Shirley Williams of Judsonia, Arkansas on 7/4/2018 . 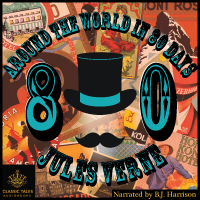 This recording makes the listener feel like he is a fellow traveler on the Nautilus participating in various adventures and discovering the many wonders of the sea. The only drawback is that classification (as in genus, species, etc.) of the living things encountered is carried to an annoying extreme.